Sitting across the table from a Viennese man I had just met at Café Ministrium, I knew this visit would be a unique one. I had walked down the famous Ringstrausse toward the Vienna Coffeehouse Conversation experience with feelings of reluctance at the prospect of dining with a complete stranger. However, I soon realized it would be a memorable experience that I would carry forever. This was going to be no ordinary conference. I was honored to co-chair the 8th Worldwide Conference on Qualitative Research (April 13-15) in Vienna, Austria. As my co-chair, Susan Abbott (Canada), and I spent time considering our ultimate goal for attendees, we embraced the theme “Symphony of Transformative Thinking.” We wanted to create an experiential event where people would leave transformed, not only in their qualitative research practice, but also as people – in the way they think, view the world, and interact with others. It was a lofty goal and we invited edgy content. Qualitative practitioners from all around the globe answered the call. Presenters from 15 countries brought forward thought-provoking ideas and case studies designed to inspire. The conference kicked off with a Coffeehouse Conversation whereby thirty attendees who signed up were paired with locals for dinner. 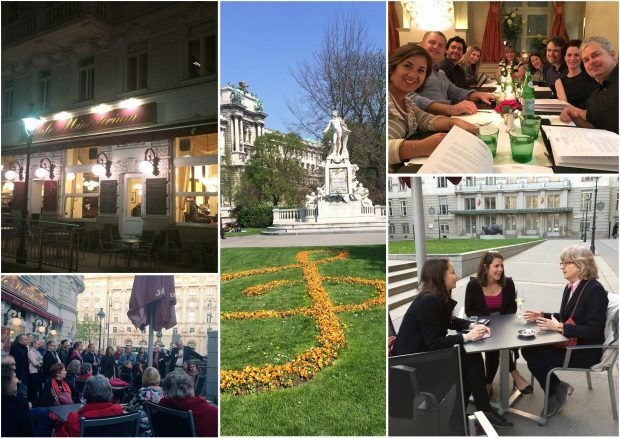 This Viennese tradition offers a venue for meaningful conversation among people without the risk of consequences so often associated with most conversations we have on important topics. The pairs worked through a menu of questions, with each “course” of questions becoming more significant as the meal and discussion progressed. The questions were drawn from the book Intimate History of Humanity by Theodore Zeldin and ranged from how your background has limited or favored you, to when the last time was that you changed your mind about something important. Great conversation was sparked and the dialogue was eye-opening and enriching. To learn more about our experience, click here. Day 1 of the conference was a fresh reminder to be present in the moment, whether with participants in research or with other people in any aspect of life. Jim Mott and Tom Law charged us to wander a bit more – to get lost and explore on our clients’ behalf, without such specific direction that leaves no room to learn what else may exist beyond our hypotheses. Rebecca Harrison and Kajel Patel suggested that we actually have 9 (yes 9!) senses and reminded us to question everything, to not simply accept as truth something that someone smart decided many moons ago. Day 2 began with an academic review of our qualitative research roots and the foundational truths that carry on today, affording us the richest possible insight into complex human beings. Peter Totman and Luke Perry made a case for the question “why?” and argued it’s actually one of the most important we can ask. We can continue to debate asking the question directly but the truth is that however we decide to frame it, we’re uniquely postured in qualitative research to uncover why people do, say, and think the things they do. True, consumers may not be able to identify and articulate the precise reason why they do or don’t do things, however our job is to listen to the words they use and how they say them and to tune into the words they don’t say. We certainly don’t base our learning solely on the face value of questions and answers. Multiple papers were presented on the importance of harnessing innovation and inviting clients into the process to dive in with consumers to learn more broadly. Emphasis was placed on the power of immersion and bricolage (multi-mode approaches) for deeper and wider learning. These topics hit particularly close to home in my own quest to help my clients get closer and closer to the people using (or not using!) their products. You know… the people who matter. A global panel focused on cross-cultural sharing offered a transparent view of their realities in research around the world. Researchers from Kenya, Poland, Austria, Brazil, and India discussed consumer differences, research challenges and considerations, cultural context, and brand passions of their region. It triggered great dialogue on how we can continue to optimize global qualitative research and be cognizant of nuances in the work we do when we’re learning from people all around the globe. Sculpting as an interview technique, leveraging improvisational comedy, and drawing from the tenants of Tai Chi were all fascinating presentations that forced researchers to take a step back and consider the impact we have at uncovering human truth. Being tactile and giving people space to express (sculpting), incorporating humor and fun, while being present (improv techniques), and bringing balance to the room for our participants and clients (elements of Tai Chi) are all ways we can elicit more from the people we yearn to understand. The conference was a whirlwind of creativity and inspiration. Our goal was transformative thinking and it delivered that…and then some. How lucky are we to be an industry where the things we work to develop professionally make us better as human beings? I’m eagerly looking ahead to the QRCA Conference in Los Angeles in January 2017 where we’ll focus on the Power of Perspective. See you there! As a member of Burke’s Qualitative team, Kendall Nash is passionate about bringing her clients closer to consumers. She loves studying and interacting with people and strives to reveal their authentic reactions, needs, and emotional connections to brands. P.S. You can follow Burke, Inc. on our LinkedIn, Twitter, Facebook and Instagram pages. © 2019 Burke, Inc. All rights reserved.